Shoya Nakajima netted a late winner as Japan beat Bolivia 1-0 in an international friendly on Tuesday night. 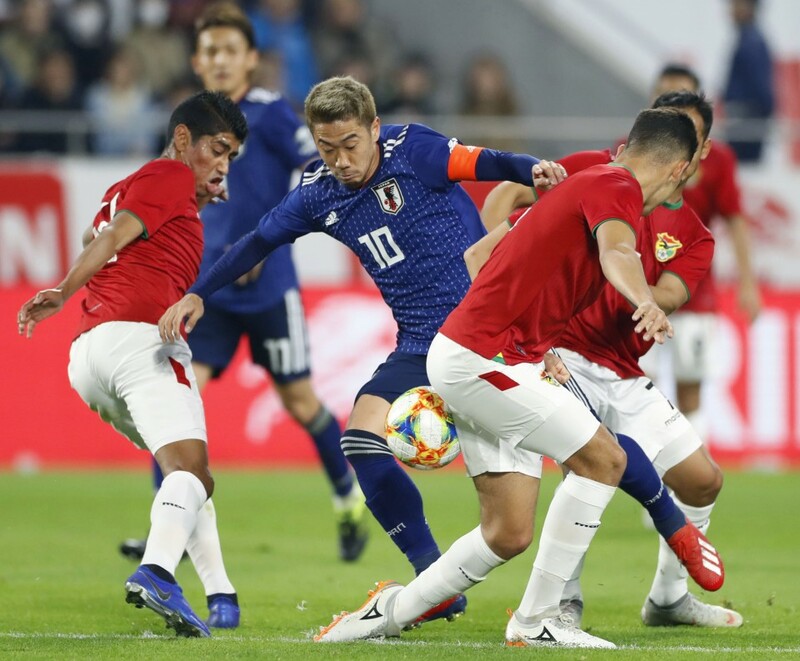 Hajime Moriyasu made sweeping changes to the side that lost 1-0 to Colombia last Friday, giving a start to several locally based players at Noevir Stadium Kobe. But with the Samurai Blue unable to capitalize on overwhelming possession, the manager called upon his favored attacking trio of Nakajima, Ritsu Doan and Takumi Minamino to get the job done in the second half. Al-Duhail winger Nakajima struck in the 76th minute, shortly after replacing Takashi Inui on the left. After winning the ball near the center circle, Groningen winger Doan went wide to Salzburg attacker Minamino, who played Nakajima into the left of the box. The 24-year-old took two touches before scoring with a dipping strike, completing an attacking movement involving all of the so-called New Big Three. 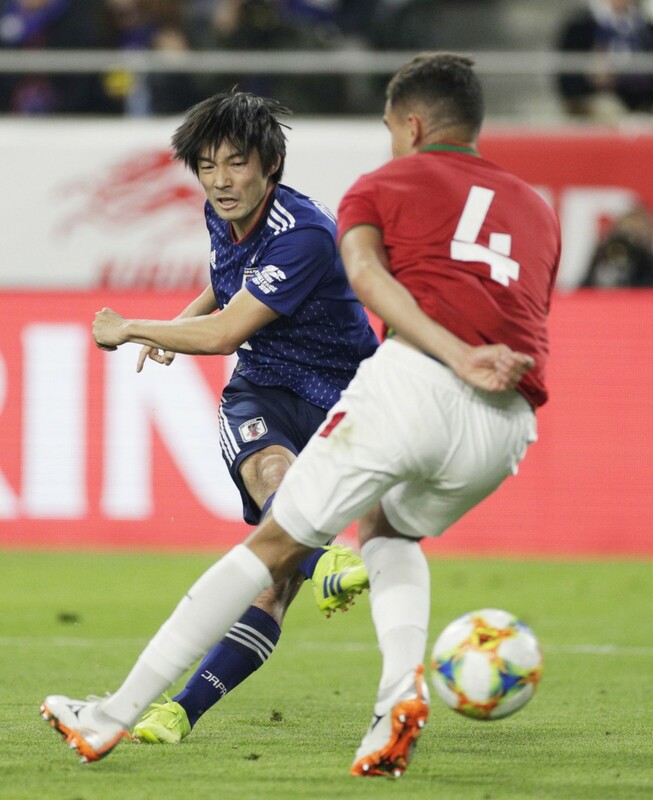 In the second of two friendlies against South American sides in preparation for the Copa America in Brazil, Moriyasu gave FC Tokyo midfielder Kento Hashimoto his first cap in a starting role. Vegalta Sendai goalkeeper Daniel Schmidt started behind a J-League backline of Daigo Nishi and Koki Anzai flanking a central pairing of Shinnosuke Hatanaka and Genta Miura. Shinji Kagawa donned the captain's armband as he made his first international start since the World Cup. The Besiktas attacking midfielder started behind Sint-Truiden target man Daichi Kamada, making his first start after debuting as a late substitute against Colombia. Also returning for the first time since the World Cup, Fortuna Dusseldorf winger Takashi Usami started on the left, opposite Inui. Japan's first chance came midway through the opening half when Inui forced a save from Bolivia keeper Carlos Lampe, making a run into the box after Kagawa picked out the Alaves attacker in space from the opposite wing. The Samurai Blue maintained attacking pressure but lacked an incisive touch against a Bolivian side comprised of domestic league players, finishing the half with just the solitary shot on target. Kamada got through on goal early in the second half, picking up a deflected pass from Inui at the edge of the box, but shot straight at Lampe. With Japan continuing to dominate possession but lacking a threat in the final third, Moriyasu went to his bench, first bringing in Doan and Nakajima for Usami and Inui, respectively. Sending on Minamino for Kagawa with his next substitution in the 68st minute, Moriyasu completed the introduction of the trio at the fulcrum of the Samurai Blue attack since he took the reins after the World Cup. The move paid immediate dividends, with the three attackers working in unison to take apart an increasingly ragged Bolivian defense. "It was good we won 1-0, but I would like the team to improve so they can score a second or third goal without conceding," Moriyasu said. "In order to build a strong national team, I wanted the players to prove to me that there are many good players among them, even among those lacking experience. I think by winning, they proved that to me." Japan will be participating in the South American continental tournament as an invited nation for a second time. Asian champions Qatar will also contest the June 14 to July 7 tournament as invitees. The Samurai Blue have been drawn at the Copa America with two-time defending champions Chile, Uruguay and Ecuador in Group C. They will play their opening match against Chile in Sao Paolo on June 17.